Using Etihad miles, you can book award flights to Europe at a big discount! You can transfer your American Express Membership Rewards, Citi ThankYou points, or Starwood points to Etihad. You May Be Closer Than You Think to an Award Flight to Europe! Via View From The Wing, folks can book a round-trip award flight between New York (JFK) and Brussels for less than half of what other airlines charge! I’ll show you how! Etihad is NOT a member of OneWorld, SkyTeam, or Star Alliance. But you can use Etihad miles to book award seats on any of its 26 airline partners. Instead of using a common award chart for all flights, Etihad uses award charts specific to each airline partner. And there are terrific deals, including flights on American Airlines and Brussels Airlines. For example, a round-trip award flight from New York – JFK to Brussels on Brussels Airlines costs only 21,972 miles round-trip in coach, and 36,620 miles round-trip in Business Class. That’s a great deal! Note: With Brussels Airlines you must book a round-trip ticket. You can NOT book individual one-ways. And you must book your flight at least 14 days before your travel dates. This is a great springboard for folks who want to explore Europe, even if your final destination is not Brussels. Because flights within Europe are usually reasonable! 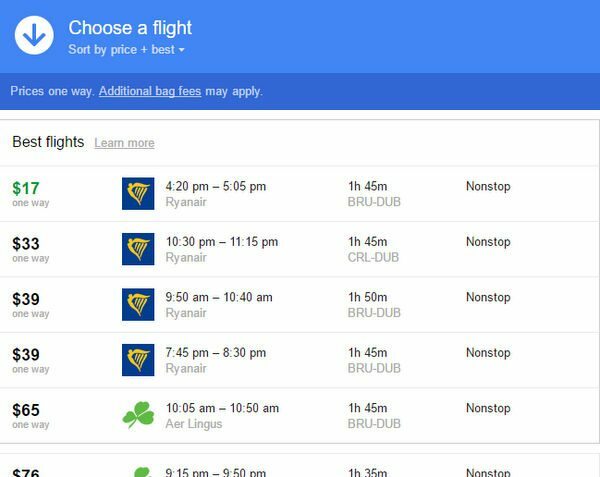 Fly Into Brussels and Hop to Dublin for Cheap! Folks can also take the train from Brussels to places like Paris, Dusseldorf, and Amsterdam. 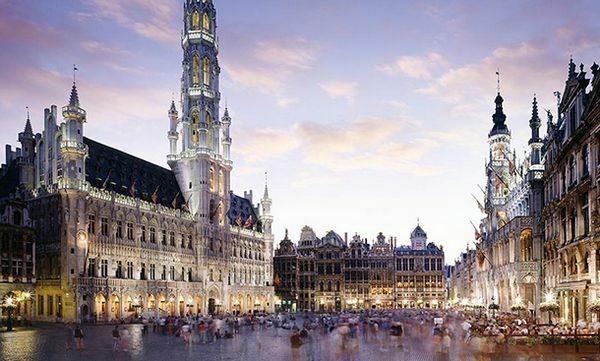 You Can Save Over 60% by Booking Brussels Airlines Business Class With Etihad Miles! This is an especially good deal for a Business Class seat. Because using Etihad miles on Brussels Airlines can save ~78,000 miles round-trip! Taxes and fees for this award flight are ~$100 per person. That’s more than you’ll pay with American Airlines or United Airlines. But easily ~$900 less than an award flight on British Airways! Brussels Airlines is part of Star Alliance. You can easily search for Star Alliance award seats on the United Airlines, ANA, and Air Canada websites. 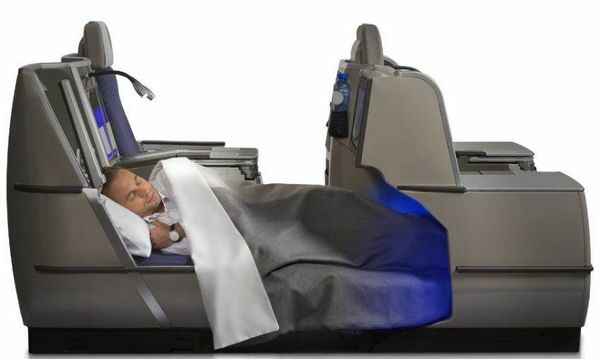 Here are some tips for finding Brussels Airlines award seats. 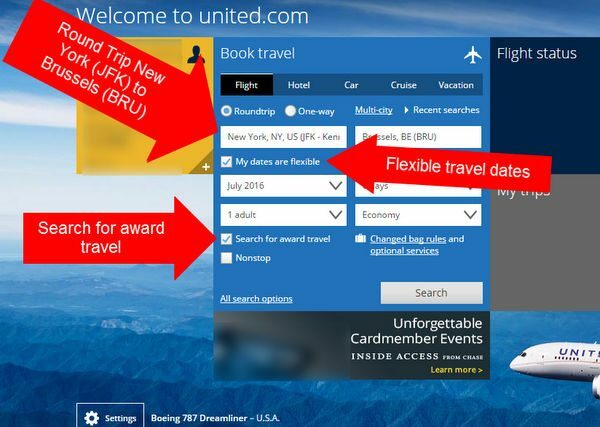 United Airlines’ website is easy to use, and is one of the more accurate resources for finding award seats. Type JFK for your origin and BRU for your destination. Look at the calendar to find the award class you want to fly. Then scroll below the calendar to see if Brussels Airlines is listed among the available flights. Look for Saver Awards, and click the one you want. Note: Clicking “Show only nonstop flight availiability” will help you narrow your search to flights operated by Brussels Airlines! When searching for a flight out of New York, United Airlines will show award flights from all 3 New York airports. So make sure you only note the flights to and from JFK! After you have found your departure and return flights, record the flight numbers, dates, and times. You will need to read them to an Etihad ticketing agent over the phone. Step 3 – Write Everything Down! Exit out of the United Airlines website. It’s time to reserve your flight! Your next step is to call Etihad at 877-690-0767 to reserve your flight. Etihad is not praised for its customer service. Many ticketing agents may not be familiar with booking award flights on partner airlines. Read the agent your desired flight information. If they are unable to find the flight, don’t assume it’s unavailable. Thank them, hang up, and try again with another agent. Etihad will allow you to reserve your award ticket for up to 7 days. Once your ticket has been put on hold, it’s time to transfer your points. There are lots of ways to earn Etihad points! 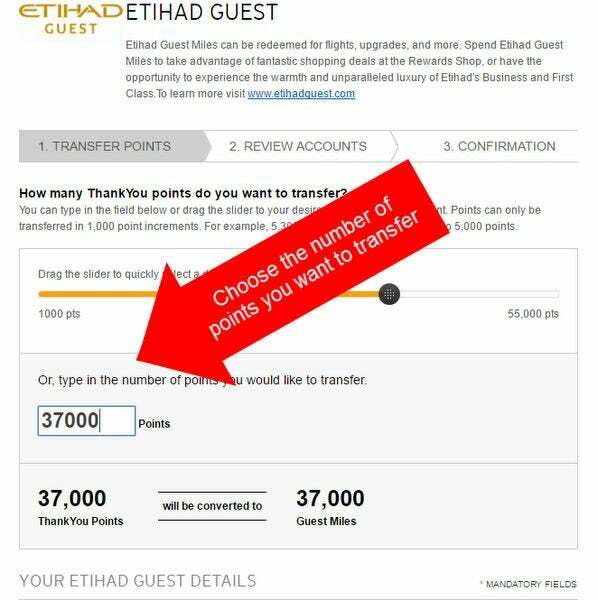 Etihad is a transfer partner of Citi ThankYou points, AMEX Membership Rewards points, and Starwood points. 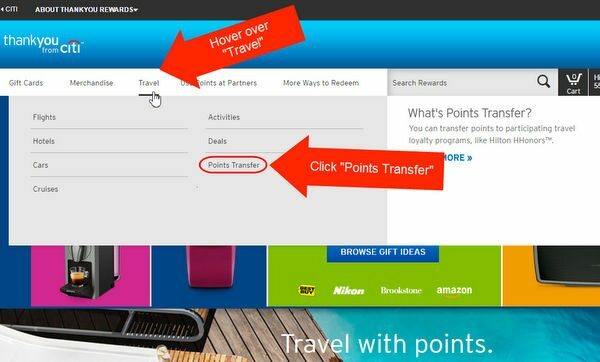 Here are general tips for transferring Citi points. The process for transferring AMEX Membership Rewards and Starwood points is similar. Go to the Citi ThankYou points website and sign in using your online banking credentials. If you have more than one Citi card, you may be asked to choose which card’s points you want to use. Here’s how to combine your points. 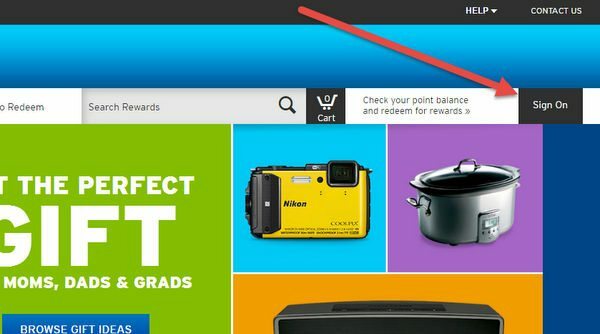 Hover over the “Travel” section in the top left toolbar, and find the “Points Transfer” button. You will be taken to a page that shows Citi’s transfer partners. Find Etihad Guest under the Air Travel partners. Etihad currently offers a 1:1 transfer ratio with Citi. But sometimes there are transfer bonuses to travel partners. American Express is currently offering a 30% bonus when you transfer Membership Rewards to Etihad. And you can get a transfer ratio of 1:1.25 when you transfer Starwood points in increments of 20,000. Because for every 20,000 points you transfer, Starwood will give you an extra 5,000 points! 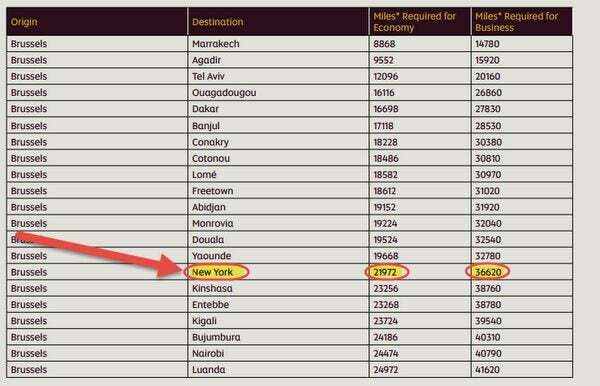 You’ll need 21,972 Etihad miles for a round-trip award ticket between New York and Brussels in coach, and 36,620 miles for a round-trip in Business Class. You can only transfer points in increments of 1,000. So, for a round-trip in coach you will need to transfer 22,000 points. And a round trip in Business Class will cost 37,000 points. 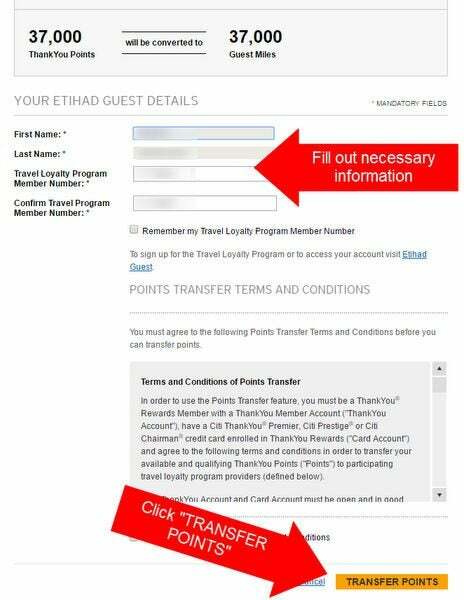 After you have entered your Etihad loyalty program number and agreed to all the conditions, you’re ready to click the transfer button. Your Citi points will then become Etihad points! Folks report Citi points sometimes take over a week to deposit into your Etihad account. This could mean trouble if there aren’t a lot of open award seats (especially for this route), because it’s possible someone else might book the seat while your miles are being transferred! Even though Etihad will let you hold an award for up to 7 days, your Citi points might take longer to deposit into your account. So booking an award seat STILL isn’t a sure thing! Folks who don’t live near New York can use miles to get to there for cheap! Because flights from New York (JFK) to Brussels are so discounted, it can still be worth spending points to get to New York. British Airways – If you are east of St. Louis, you can likely save miles by using British Airways Avios points to book an award flight on American Airlines. Use this tool by Wandering Aramean to see if this option is best for you. You can transfer Chase Ultimate Rewards points, American Express Membership Rewards points, and Starwood points to British Airways. Southwest – Southwest is often one of the cheapest options for domestic travel. Transferring your Chase Ultimate Rewards points to Southwest can be a cheap way of getting to New York. And if you have the Southwest Companion Pass, you can bring a friend for nearly free! 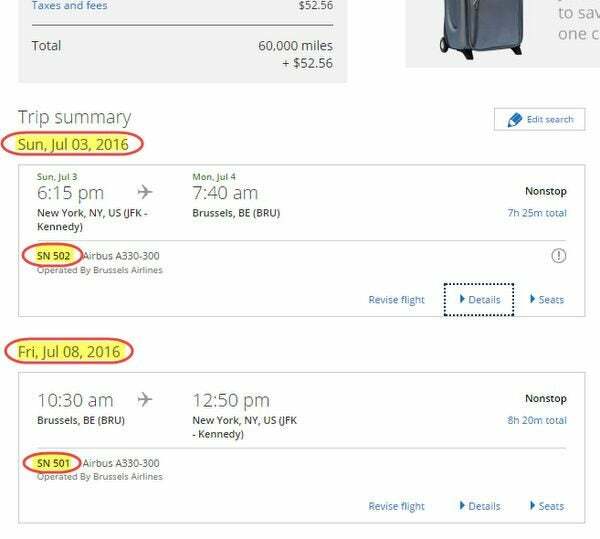 You can book the cheapest option to get to New York. But you will have to get to JFK to catch your flight to Brussels! 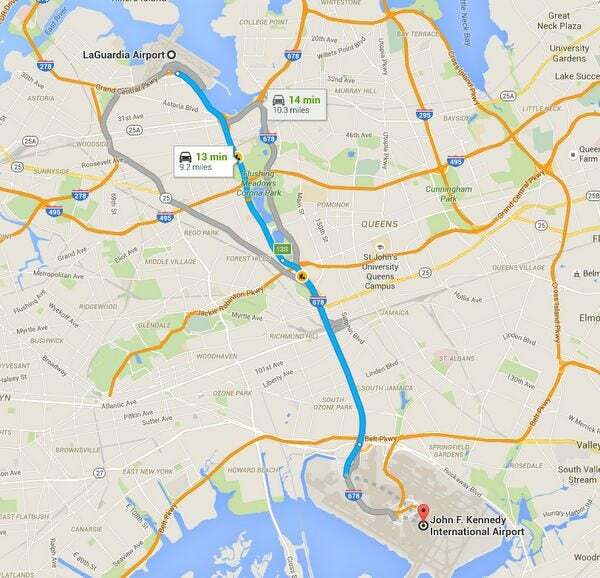 If you end up flying to LaGuardia or Newark, make sure you budget enough time for uncertainties! Traffic can easily increase a 15 minute drive time to 1 hour! 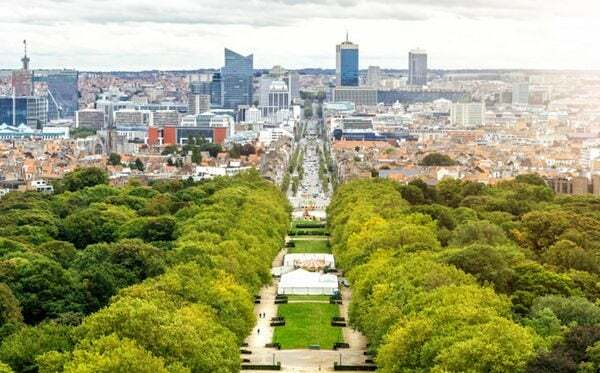 Brussels is much more than just a launching pad for your European adventure! There is plenty to see in the city of Brussels, like the Old Town, the Atomium, and its museums. Belgium also has great food, and is known for chocolate, fresh seafood, and of course, waffles! You can save thousands of miles booking award flights to Europe with Etihad. Folks can fly from New York (JFK) to Brussels for less than half the miles of other airlines! 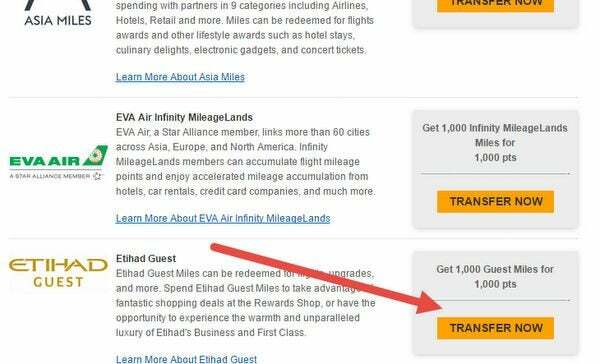 Etihad miles are easy to accumulate because Etihad is a transfer partner of AMEX Membership Rewards points and Citi ThankYou points. and Starwood points. Have you booked award flights using Etihad miles on partner airlines? Please share your experience in the comments! Is it ok to have the return flight from Brussels to JFK be brussels air and swiss international for the connecting flight? Or does it all have to be only operated by Brussels air? I am searching multiple dates and not seeing any return flights with only Brussels air on it. I’m very confused. So this is definitely one-way? I thought it might be too good to be true. I also found many flights on EWR to Brussels for 30K miles on Brussels Air through United.com. And the returns all had stopovers but still on Brussels Air. So it’s not just from JFK is it and are stopovers ok? Read the disclaimer at the bottom of the table: these values are for roundtrip. One way redemptions are not permitted. Just called the Etihad Airline ( at 877-690-0767 ), giving out my Etihad number. 1. Can NOT make a reservation without miles in the account. Therefore, one may need to transfer points first. 2. One way is 21,972 Etihad miles, round trip times 2—> 43944 miles. Does this mean the 36,620 miles Brussels-JFK is the price for a one-way redemption? Or a RT redemption? It’s unclear.